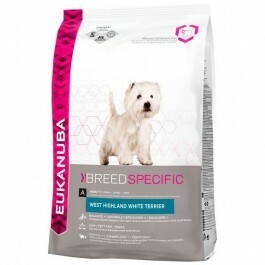 Eukanuba Breed Specific Adult 1+ Years West Highland White Terrier Dry Dog Food 2.5kg is a 100% complete and balanced pet food for adult West Highland White Terriers. It is also suitable for Scottish, Cairn & Welsh Terries and Miniature Schnauzers. Eukanuba's Best Adult Dry Dog Food for West Highland White Terriers, also ideal for Scottish, Cairn & Welsh Terries and Miniature Schnauzers, is formulated with extra essential dental minerals to help maintain strong and healthy teeth. This canine food Breed Nutrition diet is also formulated with higher levels of prebiotics* that will help promote your dog's digestive health and has reduced fat* to help maintain an optimal body weight. It also has clinically proven antioxidants that help build strong natural defences and Omega-6 and 3 fatty acids that contribute to a healthy skin and radiant coat. Plus, while the animal-based proteins help maintain strong and lean muscles, calcium helps support strong bones. Eukanuba Breed Nutrition formulas are developed with veterinarians and recommended by top breeders, made with high quality premium ingredients, to give your dog 100% complete and balanced nutrition. Every Eukanuba Adult Dry Dog Food diet has 3D DentaDefense technology, which cleans with every bite, reducing tartar build up by up to 80%** and also helps your dog maintain strong teeth. * vs. Eukanuba Adult Dry Dog Food for Small Breed ** results may vary. Breed Specific: To meet the needs of special breeds. 1 Balance + - Promotes optimal digestion with higher level of prebiotics (vs Eukanuba Adult Small Breed). 2 Slim - 30% less fat than Eukanuba Adult Small Breed. 3 Dental + - With extra essential mineral to reduce tartar buildup, reduce plaque and maintain strong teeth (vs Adult Small Breed). 4 Power - Clinically proven to help support lean muscles with animal proteins. 5 Shine - Promotes healthy skin and radiant coat with clinically proven optimal ratio of omega 6 and 3 fatty acids. 6 Defend - Helps support a West Highland Terrier's strong natural defences with clinically proven antioxidant. West Highland White Terriers are friendly, confident dogs that thrive on a lot of attention. In order to be in top condition their weight must be controlled. Their sensitive skin as well as their teeth may benefit from special nutritional care. Also suitable for Scottish, Cairn & Welsh Terriers, and Miniature Schnauzers, who share the same nutritional needs. Eukanuba Adult Weight Control for Small Breeds is a 100% complete and balanced food for small breed adult dog to help them achieve their optimal weight..
Royal Canin Adult West Highland White Terrier is a complete food for dogs, specially adult and mature West Highland White Terriers over 10 months old.